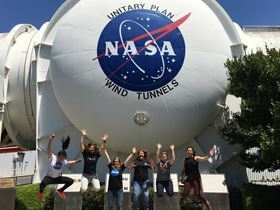 Women engineers at NASA enjoying INWED 2017.
International Women in Engineering Day (INWED) is an annual festival developed by the Women’s Engineering Society (WES) to celebrate women engineers worldwide and inspire future generations. The theme of INWED18 is ‘Raising the Bar’, which looks to the future of engineering. The Women’s Engineering Society (WES) is a charity which formed in 1919. Its objectives are to support women to achieve their potential as engineers, applied scientists and leaders and to reward excellence. It aims to encourage and promote the education, study and application of engineering and to work with organisations and influencers to promote gender diversity and equality in the workplace and sustain the historic legacy and future effectiveness of WES. Even in 2018, which is the Year of Engineering, fewer than 11% of the UK’s engineering workforce is female and WES believes that supporting and encouraging more girls and young women towards a career in engineering would see a two-fold benefit. Firstly, with a looming skills gap in the industry, a wider talent pool of engineers would be available in the future, and secondly, it would create more diversity in the sector. INWED takes place annually on 23 June, on the anniversary of the foundation of the Women’s Engineering Society. Since its UK launch was co-ordinated by WES in 2014, the popularity of Women in Engineering Day, with its widespread events and celebrations, has grown far quicker than expected and in 2017, the international version, INWED was born. INWED17, endorsed worldwide by UNESCO, saw 150 separate events registered on the INWED website, both in the UK and internationally and more than 1.2 million people were reached on social media. INWED is an accessible way for companies, institutions, organisations, schools, universities and individuals to raise the profile of women in STEM and related sectors. It’s also an opportunity for them to showcase a commitment to diversity and inspire future generations by organising their own events and activities, under the INWED banner. This can be done on or around 23 June, events registered on the INWED website, and the word can be spread on social media with the hashtag #RaisingTheBar. Hundreds of events will be taking place this year, including talks, tours, open days and debates, competitions, networking events, site visits, videos and campaigns. Working in partnership with internationally recognised names from the engineering world, INWED aims to foster a spirit of co-operation, collaboration and enthusiasm, to highlight positive role models, and to inspire future and current generations of women to achieve their potential. The theme for INWED18 is ‘Raising the Bar’, and WES is encouraging the use of the hashtag #RaisingTheBar on social media. This theme reflects the vision and aims of WES, as well as pointing the way through 2018 to the WES centenary in 2019, where the theme for INWED19 will be ‘Engineering Futures’. WES wants to support and celebrate those individuals, schools, colleges, groups and organisations who have visibly demonstrated their support for diversity in engineering. Participants can include the ‘Raising the Bar’ theme in their INWED event or activity and sharing event information with WES, by completing the Event Notification Form on its website. Schools, colleges, universities or organisations who would like to be involved can also send WES a case study for its website about how they have been ‘Raising the Bar’ or have exceeded expectations within engineering and increased equality between male and female colleagues in the workplace. WES also suggests that companies or individuals encourage women engineers or other professionals within their organisation to nominate a colleague (male or female) who has become a diversity champion and who is ‘Raising the Bar’ to remove barriers to diversity and equality. Anyone can tweet an image of an inspirational female role model who has demonstrated excellence in terms of ‘Raising the Bar’ for women and girls in an engineering career. Whatever an individual or organisation does, WES asks that they take pictures of the event, share them on Twitter and Instagram and send them to WES for inclusion in its INWED18 photo gallery. There are many ways that organisations can get involved, both in preparation for INWED18 or throughout the year and WES is there to advise and help them to contact the right people within the industry. Schools and colleges can invite women engineers to give talks about their careers and WES can help contact them with its register of women in engineering. Schools can also launch a science fair or competition, not just to inspire innovation and creativity, but also to show that engineering can be fun. Other suggestions from WES include debates to get students talking about gender equality in engineering or a STEM careers event for students and their parents. Universities can get advice from WES about how to encourage young women to apply for engineering courses and how to support their own students. WES suggests organising a departmental open day with female role models present, or panel discussions with engineering professors and industry professionals. Universities can also organise networking events with local engineering companies or a hold a prestige lecture given by a female engineer. University departments can join WES as an Education Partner, set up a WES Affiliated Student Group and promote the WES Student Conference. WES is a network of women engineers, scientists, and technologists, pursuing a vision of a better world. Members work together to empower women to achieve their potential as scientists, engineers, and leaders. If you’d like to join the Women’s Engineering Society and support its goals, you may be surprised to learn that you don’t have to be female or an engineer. WES offers both individual memberships and a Partnership Programme for organisations. WES members are eligible to apply for the MentorSET programme, a mentoring scheme which aims to increase the number of women who seek to develop and realise their full potential in STEM careers. There’s more information on the WES website. The Partnership Programme enables organisations to help WES with the work it does supporting women engineers and encouraging girls to see engineering as a career option, as well as helping companies with their diversity and inclusion programmes.